Korea’s locally developed space rocket engine Korea Space Launch Vehicle-2 Nuri test-launches at the Naro Space Center in Goheung, Jeollanam-do Province on Nov. 28. 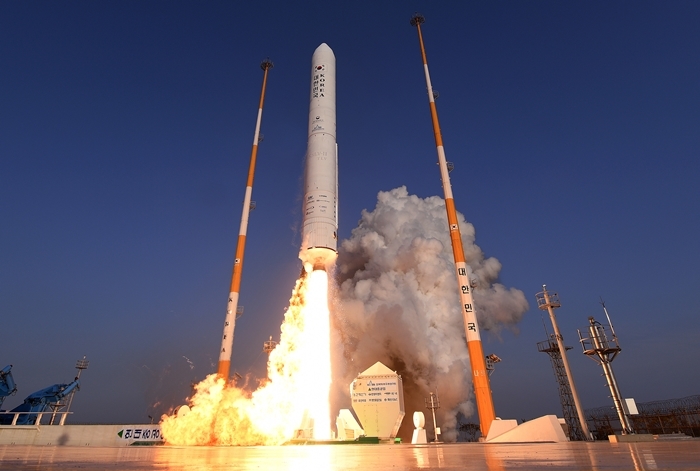 Korea successfully test-launched its homegrown Korea Space Launch Vehicle-2 (KSLV-2) Nuri at the Naro Space Center in Goheung, Jeollanam-do Province on Nov. 28. The critical rocket motor combustion time was maintained for 151 seconds, which surpasses the initial goal of 140 seconds. The rocket reached its maximum suborbital altitude of 209 kilometers after flying 319 seconds. The 75-ton rocket engine tested on that day will be used in the second stage of the three-stage KSLV-2 Nuri. The engine was developed and built with local technology. “Korea’s space technology has gone up a stage today,” said Lee. Korea is the seventh country in the world to build an indigenous 75-ton-class space rocket engine.